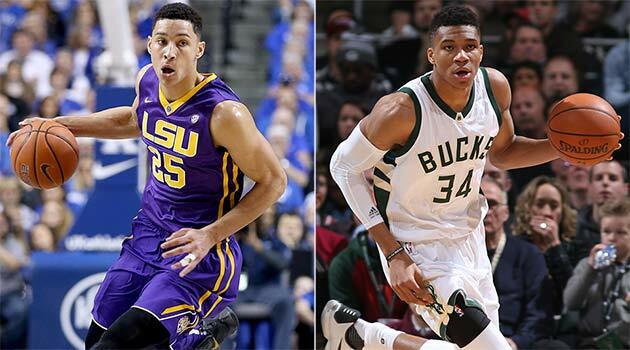 Welcome to science-fiction basketball, where Giannis Antetokounmpo is the blueprint and Ben Simmons is the future. By the time the NBA calendar turns to March, there aren't many surprises. The best teams are still the best (Spurs, Warriors, Cavs). The teams with all kinds of issues (Pelicans, Kings, Rockets) still have all the same issues. Even the best young players have long since staked their claim to the future (Karl-Anthony Towns, Kristaps Porzingis). After four or five months, whatever the story is, we've got it. Everyone's just ready for the playoffs. However ... Have you seen Giannis Antetokounmpo the past few weeks? Here he is Euro-stepping from the top of the key, and pump-faking his way into a dunk. Here he is spinning through a double team on the way to another slam. Here's a steal that turns into a fast break and behind–the–back pass. One night he's coming out of nowhere to obliterate a Kevin Durant floater, another, he's blowing by Jae Crowder on the baseline. Since mid-February, Antetokounmpo is averaging 19.6 points, 9.6 rebounds, 8.1 assists, 2 blocks, and 1.7 steals, on 50% shooting. Look at the most efficient lineups since the All-Star Break. You'll see the Warriors, Spurs, Cavs, Hawks, Thunder... and two Bucks lineups. This year's Milwaukee team has been a disappointment after crashing the playoffs last season—like most NBA stories, that one's been written since January—but the Giannis Awakening is new. It's scary. It's thrilling. He's a human triple double playing point guard and guarding power forwards, and even now, you get the sense that he's only scratching the surface. I watch entire Bucks games and I still have no idea what this team is doing, or where it's all going. There was another highlight that caught my eye last week. Giannis gets free off a back screen and cuts to the hoop, gets a lob, and then as the defense rotates over, he calmly taps to a wide–open Greg Monroe in the high post, who then swings it to a wide–open Jerryd Bayless. It all happened in about three seconds, but it looked so easy, and the defense was helpless. This is what Ben Simmons can do. As we move through the dog days of the regular season, Simmons is the other story that's had the NBA buzzing. Is he overrated? Why didn't he shoot at LSU? He took three three-pointers all season? How is that even possible? Shouldn't we be concerned that he looked checked out for the final six weeks of LSU's season? Can he take over games? How do you use him in the NBA? Should he really be the No. 1 pick in a league that's now dominated by the one thing he can't do? All of those are fair to ask. I'm not here to say that Simmons should definitely be the top pick, or that everyone is overthinking this debate. They're not. There are real questions to ask, and assuming that he'll solve the shooting issues is probably the wrong answer. LeBron's shooting improved as he matured, but he was much further along at Simmons's age, and more aggressive from the perimeter. Draymond Green is bigger, tougher, and a better shooter. The Spurs' development of Kawhi Leonard's jumper is basically unprecedented, so using that to sell Simmons is pretty dicey. Lamar Odom almost works, and I saw someone throw out Toni Kukoc, but Simmons is more explosive than either one. If you're trying to fit Simmons into one of these categories, there will be holes in the logic. Giannis is the blueprint. We're talking full-on science–fiction basketball. It starts on defense, where both Simmons (eventually) and Antetokounmpo (right now) can guard power forwards even as they play as point guards on the other end. That allows them to create chaos and easy looks as teams scramble to switch assignments in transition, because no power forward is quick enough to stay with them in transition. Likewise, it creates mismatches in the halfcourt as someone like Ricky Rubio is asked to deal with Giannis and his 100-foot wingspan. As for the shooting? Giannis is at 21% from three for the season. Since the All-Star Break, he's at 0%, but nonetheless powering some of the most successful lineups in basketball. When the defense dares him to shoot in the halfcourt, he's big enough to force his way into the lane and draw extra defenders. Nobody knew Giannis would be this effective distributing in those situations, but he's now so good that the Bucks' losing season doesn't even matter. He had another 11 assists last night, in another win. And if those guard skills have been a surprise in Milwaukee, vision and feel for the game were probably Simmons's two greatest strengths at LSU. In both cases, the players can run the offense from inside the key and literally turn the defense inside out. Their athleticism will force defenses to rotate as they get closer to the rim, opening up ripples in the defense that their size allows them to see better than anyone. None of this guarantees success for Simmons. He'll have to be more engaged than he was at LSU. ​He won't have the scrutiny-free existence of a rookie from the middle of the first round—he's been criticized more in the last two weeks than Giannis has been his entire career. He'll also need a team with imagination to make this work. That Bucks blueprint is very new. I didn't even make the connection until a few weeks ago when my friend Frank Madden pointed this out. Also, Simmons doesn't have the freakish length that Giannis has—nobody does—and he'll never be as effective on defense. But what Simmons lacks in length he makes up for with feel and skill. Surrounded by talent (and shooting), he could be every bit as deadly as what's happening in Milwaukee. So... if post-All-Star Giannis is the ceiling for Simmons, doesn't that make him worth a No. 1 pick? Probably, right? If not, it should be because teams think Brandon Ingram's ceiling is even higher—not because Simmons's jumper makes him less exciting. That's actually the most important point here. What's been great about watching Giannis develop is that until the last few weeks, nobody had any idea what all that size and skill might turn into. We just knew it would be something good, and in the meantime the chaos would be entertaining. That should be the Ben Simmons conversation we're having for the next year or two. Embrace the chaos, because aside from a few weeks of Bucks games, none of the comparisons will do him justice. He's not LeBron James, he's not Anthony Davis, he's not Kawhi Leonard or Lamar Odom or any of the names people throw out to describe him. History can only explain so much. If you want to know the future, try science fiction.